dunnslakemonster grossly overpriced. when full the cover does not snap tightly enough to carry by the handle. large corner broken off but not sure if it happened before, during or after being shipped therefore did not return. contacted customer service but never received any response whatsoever. shipping took longer that expected. will not order from taylor gifts again. CyndyK2 I now have three of these boxes, and they hold all the ornaments that used to take up two huge cardboard boxes full of disintegrating original boxes. 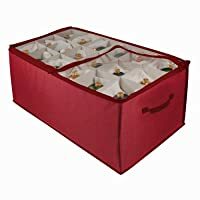 These storage containers are easy to carry, keep my ornaments safe, can be altered with the included dividers for various sized items, and the sections snap together with a lid for the top and a carrying handle. It just doesn't get any better than this! It even has a little box in the center for those tiny items that always get lost in other boxes. In short, it's PERFECT. Jacquie I hand-paint miniature scenes on ornaments, which I market at shows. I can VERY easily organize, carry, display and/or just view, & store in these. I own 2 and am buying 2 more!!!!! Love 'em! Barb I hand-paint miniature scenes on ornaments, which I market at shows. I can VERY easily organize, carry, display and/or just view, & store in these. I own 2 and am buying 2 more!!!!! Love 'em! jane.freund[@] I LOVE this product. It is easy to use for Christmas Ornaments. If it doesn't fit in a Slot you can take them out and lay item flat in box. Well protected and if snapped together it is easy to carry. I use the box to put nick-nacks into till I am ready to put Christmas ornaments back into it. You can use dividers or you canlay them on the bottom. Elizabeth These storage containers are exactly what I have been looking for! I fit all of my Christmas ornaments into these 4 containers, so now they are not spread all over in 20 boxes of different shapes and sizes. The only minor suggestion I have is that the dividers within each layer are cardboard and I don't see why they couldn't be plastic for more durability. Otherwise they are great, I am very satisfied! Paula, the ornament queen I really find this easy to use, especially for all my less delicate ornaments. I arrange the dividers to best fit my ornaments and I put one in each opening. I can add or subtract trays so that I can also organize by type. The only problem I have found is that the plastic is a little brittle when it is very cold so I let it warm to room temperature before I open it. DEBBIEofPA These are great organizers. I bought two and need 2(or 3) more. The only drawback I found is that the dividers inside are cardboard, and need to be assembled. I also wish one box was taller, for taller ornaments. This would be great for craft storage, or in a workshop too. Curly Girlie This organizer is small yet compact. You get a lot in a little. Takes up little space, its stacks great and it is very versatile. Its not just for Christmas ornaments it can be used for anything that needs to be stored without the worry of moisture getting in. I even bought one as a gift. I purchased these because I could only find items like it with cardboard dividers. Well I was very unhappy when the product arrived with exactly that. The dividers are cardboard. The picture leads you to believe that they are plastic of some sort.